Let me tell you a story about my first backpacking trip. I was eleven years old and had no idea how or what to pack. Most memorably, I brought some uncooked eggs in a flimsy plastic holder. This went about as well as you might expect, and I spent the rest of my time in the Uinta Mountains with egg yolks coating all of my gear. The biggest mistake I made on that trip, however, was overpacking. I carried a 30 pound external frame pack on my 80 pound body. The Achilles tendinitis stayed with me for years afterward, as did my impression that backpacking was a painful experience. Despite that, I still enjoyed it. The rewards of great views, quality time with family, and the wilderness skills I picked up as a Boy Scout made it all worthwhile. Every trip I have been on since then has taught me something new, but the number one lesson I have learned is to pack lighter. I eventually realized that backpacking does not have to be painful if you lower your pack weight. The most common mistake novice backpackers make is to carry too much weight. Although carrying a heavy load on your back can strengthen your quads, it will also make you miserable. Unless you have a mild case of sadomasochism like myself, you will dislike an activity if it is miserable. For that reason, I suggest to everyone that reducing your carrying weight is the key to happy hiking. Believe it or not, the pack itself is one of the heaviest items a person carries on a backpacking trip. Often, it is in the same weight class as a tent or sleeping bag. The first place to start on your journey to a lighter load is to pick out a lighter pack. To help you get started, I created this buying guide to go over features and demonstrate how to choose the best lightweight backpacking pack for weekend, multi-day, and long-distance treks. Once you lower your pack weight, you might even find yourself hiking more miles and seeing more of what the backcountry has to offer. The average 60 liter pack weighs about 5 pounds. All of the backpacks I have included in this post are around 2 pounds or less. That can mean about a 15 percent reduction in total pack weight right out the door. Over the miles you hike, your legs, shoulders, and back will notice a big difference. In order to make a lightweight backpack work, you will need to get your base weight (everything but consumables) under 20 pounds. This is because lightweight backpacks are not designed to carry as much weight as their heavy duty counterparts. They also have less room than heavier packs, so you will want to make sure your gear is compact and compressible. When it comes to backpacking packs, roomier is not always better. For one, the capacity to carry more may lull you into bringing more gear you don’t need. The constraint of a lower volume pack can force you to pack less. Certainly, you don’t want to take this to the extreme and skimp out on the necessities. 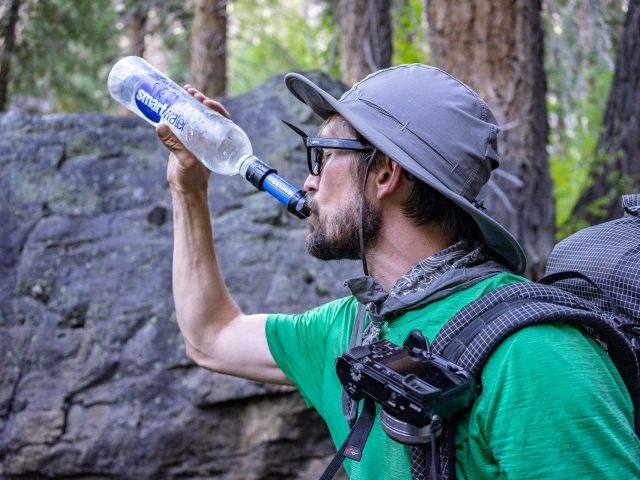 Being unprepared on a backpacking trip can cause serious problems that outweigh the benefits of a lightweight pack. If your base weight is in the 10-20 pound range, a 40-60 liter pack is probably sufficient. For 3-season backpacking, these figures represent a favorable zone to be in under most circumstances. In winter conditions, your base weight will increase and as a result, you will want a higher volume pack. There are three types of backpacking frames: Internal frame, external frame, and frameless. Internal frames are by far the most common type of pack you will see on the trail. They are compact and hold the weight close to your body, giving you stability as you hike. They concentrate weight around the small of your back and hips. Although many are made with aluminum, an increasing amount of internal frame backpacks are constructed with carbon fiber, an unbelievably strong yet lightweight material. External frame packs came about before lightweight gear was a thing. They are sturdy, bulky, and can weigh upwards of 8 pounds. The frame sits on the outside of the pack, giving you a handy place to hang just about anything your heart desires. They have a high center of gravity, making the carrier more top heavy and less agile. The benefits of these? They are designed for heavy loads and provide lots of space for gear (both on the outside and inside). You can also find one at a war surplus store for under $50, or inherit one from your grandpa for free. When the ultralight approach started to gain popularity among backpackers, frameless packs became the norm. However, the use of carbon fiber has made internal frames lighter and more supportive, and rendered frameless packs obsolete for long distance use. Frameless packs are light, but they do not provide much support. Most backpacking packs are made from ripstop nylon or Dyneema. Dyneema is superior to nylon in a lot of ways. It is stronger, lighter, and more water resistant. Nylon is stretchable and costs less. If you decide to buy a nylon backpack, a rain cover is a good idea for stormy weather. In the past, I have used Sea to Summit’s cover and liked it. Otherwise, line the inside of your pack with a garbage bag to keep your stuff dry. In order to determine your correct backpack size, you will need to measure your torso. To get an accurate measurement, have a friend measure the distance between your C7 vertebra and your mid back at the level of your iliac crest. Most gear stores can also do this for you. Your C7 vertebra is the biggest bump at the base of your neck. To find the iliac crest, feel along your hip to the highest point on the top of your hip bone. Now, follow this to the middle of your spine. Once you have a torso measurement, you can use it to place yourself within the torso ranges listed for a given backpack. If you are shopping online, you can find this information under the product specifications. Below are my recommendations for the best lightweight backpacking packs. For more than 40 years, Osprey has made quality backpacks with a lifetime guarantee. Until the Exos series was created, all of their backpacking packs were a bit too heavy to be considered ultralight. In early 2018, Osprey relaunched the series and added women-specific versions, called the Eja series. Tip: For an even lighter pack made by Osprey, check out the Levity. The Talon 44 is Osprey’s other lightweight backpacking pack. Like the Exos, it features a removable top lid which makes it possible to further reduce the pack’s weight. Its max load is listed at 40 pounds, but given the Talon’s lightweight materials and construction, 30 pounds is a more realistic carrying weight. If you are looking to go as light as possible, the Zpacks Arc Blast is a best in class pack that receives rave reviews from ultralight enthusiasts. Its carbon fiber frame can be cinched down to form an arc that puts space between your back and the pack’s contents. This transfers the weight to your hips and makes for a comfortable fit, despite minimal padding. For heavier loads, look into the Zpacks Arc Haul-Zip. Hyperlite Mountain Gear continues to wow backpackers with its ultralight 2400 Southwest pack. Its water resistance, durability, load rating, and extensive features all contribute to its mythic status among thru-hikers. When you buy a 2400 Southwest, you get everything: Hip belt pockets, side pockets (for water bottles), a roll top closure, and compression straps. The ULA Circuit is made from durable, lightweight materials but does not compromise comfort whatsoever. With 68 liters of volume, the Circuit has plenty of room and if needed, can support heavier loads. For a lightweight backpack, it is quite affordable and gets a lot of praise. The Granite Gear Crown 2 is the lightest backpack I have found that features a removable top lid. Its main claim to fame is that a bear canister fits snug underneath the top lid, so you can save room in the main compartment. It also has taller than average side pockets, which is an uncommon luxury among lightweight backpacks. Gossamer Gear’s Mariposa is another lightweight backpack with a large carrying capacity, at 60 liters. The Mariposa is a tough, top quality pack that wears comfortably in the 30-35 pound load range. With the Flex Capacitor, Sierra Designs has developed a clever and unique backpack. It includes lateral straps that can be cinched down tight or loosened to accommodate fluctuating loads. The Flex Capacitor also employs a robust aluminum frame system reminiscent of tent poles. 04/08/19 – Added Top Picks and More Options headings, added Osprey Levity tip. Where’s the Gregory Optic?? It’s receiving much praise and outshines the Exxos especially the 2018 Exxos..
Do you own a Gregory Optic? If yes, how is it better than the Osprey Exos (2018)?